Viktor Korchnoi (also Korchnoy, Kortchnoy, Kortchnoj, etc) (Ви́ктор Льво́вич Корчно́й) (born March 23 1931) is a professional chess player. He was born in Leningrad in the USSR. International Master by FIDE in 1954, and the title of Grandmaster in 1956. Many people consider him the strongest player to never have become world champion, an honour equally often attributed to Paul Keres. Korchnoi�s playing style initially was an aggressive counter-attack. He excelled in difficult defensive positions. During the sixties he became more of an all-rounder, mastering all the required techniques like Bobby Fischer and Petrosian. Korchnoi�s mood largely dictated his plan for the game. He was comfortable playing with and without the initiative. He could attack, counterattack, play positionally, and was a master the endgame. He became known as the master of counter-attack, and strangely enough he was Mikhail Tal�s (an out-and-out attacker) most difficult opponent. He has a lifetime plus record against Tal, as well as against world champions Petrosian and Spassky. He has tied records against Botvinnik and Bobby Fischer, and has at one point or another beaten every post-war world champion except Vladimir Kramnik. Korchnoi reached the Candidates Final, the match to determine the next challenger to Bobby Fischer scheduled for 1975. His opponent was a friend (they had played a training match together some months before), and the newest star of the Russian chess-school, Anatoly Karpov. Karpov won this phenomenal contest, played in 1974 in Moscow, and by default became the next World Champion when Fischer refused to defend his title. 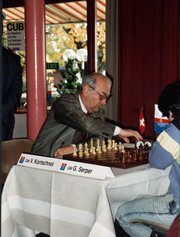 It was during this match that an often repeated story occurred (which Korchnoi himself confirmed): Korchnoi got up from the board during the twenty-first game, walked over to the arbiter and, showing a surprising ignorance of the rules, asked whether he could legally castle in the current position (which was crushing thanks to a devastating opening novelty). He wanted to castle kingside, but his rook was being attacked by a bishop, and apparently he didn�t know if he could castle if the rook was under attack. The arbiter informed him that he could, and Korchnoi soon won. Korchnoi�s international tournament record was impressive, but the lack of opportunities dented his confidence. As a result, during the 1976 IBM sponsored chess tournament in Amsterdam Korchnoi was the first Russian grandmaster to defect from the Soviet Union. During the tournament itself, Korchnoi asked for advice on how to ask for asylum from English speaking grandmasters! Korchnoi resided in the Netherlands for a few years, giving simultaneous exhibitions. He played a short match against Jan Timman - the strongest active non-Soviet player at that time - and comprehensively beat him. This demonstrated the continued superiority of the Russian approach to chess. His defection resulted in a turbulent period of excellent tournament results, debacles in the two matches for the World Title - all overshadowed by the cold war politics. There was a vacuum in World Chess after the non-appearance of Fischer. Karpov was branded a paper-champion, having never won a match for the world title. But there wasn�t a recognised contender to his dominance. Up stepped Korchnoi, after winning his way through another physical and psychological Candidates cycle. It was even rumored that his Candidates match with Petrosian resorted to kicking each other under the table. However, Korchnoi denies this. According to him, Petrosian just kicked his legs nervously and shook the table. Whatever the reason, at some point Petrosian refused to play with Korchnoi anymore and left the match, so Korchnoi was declared a winner. The World Championship match of 1978 was held in Baguio in the Philippines, and rightly deserves its reputation as the most bizarre World Championship match ever played. Karpov�s team included a Dr Zukhar (a well known hypnotist), while Korchnoi adopted a local renegade currently on bail for murder. There was more controversy off the board, with histronics ranging from X-Raying of chairs, protests about the flags used on the board, the inevitable hypnotism complaints and the mirror glasses used by Korchnoi. When Karpov�s team sent him a blueberry yogurt during a game without any request for one by Karpov, the Korchnoi team protested, claiming it could be some kind of code. They later said this was intended as a parody of earlier protests, but it was taken seriously at the time. In quality of play the match itself never measured up to the press headlines that it generated, although as a sporting contest it had its good share of climaxes. Karpov took an apparently unassailable early lead, and looked to be on the brink of an easy victory. Korchnoi bravely fought back, winning three out of four consecutive games, to equalise the match at five wins apiece, but Karpov won the very next game, and won the match by 6 wins to 5 with 21 draws. Korchnoi won the next Candidates cycle to again earn the right to challenge Karpov in 1981. The match was held in Merano, Italy. The headline of the tournament again largely centred on the political issues. Korchnoi�s wife and son were still in the Soviet Union. His son was promised to be released to join his father in exile if he gave up his passport. When he did so he was promptly drafted into the Russian army. Korchnoi took the opportunity of the match to publicise the situation of his wife and son, drafting an open letter to the Soviet government to release them both. This continuing effort likely led to his dismal performance as Karpov swept to victory in what was dubbed the "Massacre of Merano". In spite of the protests, Korchnoi�s son was arrested for evading army service, sentenced to two and half years in labour camp and served the full sentence. After the release, he was again refused to leave USSR. Only 6 years after Korchnoi�s defection, his son succeeded in leaving the USSR. Korchnoi, however, still had a vital part to play in the next Candidates cycle, although he never reached the highest pinnacle again. During the next cycle Korchnoi had moved to the United States, and was matched to play the young Russian protege Garry Kasparov who at the time was battling against the Russian chess federation that was clearly in favour of Anatoly Karpov. Korchnoi seems to have great fondness for Garry Kasparov - possibly because he recognised the situation Kasparov was in - a prominent talent overlooked by the Russian bureaucracy. The match was to be held in Pasadena, California, where Bobby Fischer was residing at the time, but the Russian chess federation protested (possibly because Korchnoi was a defector and the match was in the cold-war enemy�s back yard), and Kasparov was not allowed to fly there to play the match. This defaulted the match to Korchnoi. However, after a remarkable series of events Korchnoi agreed to replay the match in London. This was a gracious gesture by Korchnoi, since technically he had already won by default. After a good start, Korchnoi was blown away by Kasparov�s attacking play. During the eighties Korchnoi continued playing at a top level, although overshadowed by the Karpov - Kasparov conflicts. He continues playing in Europe to this day, living in his adopted country of Switzerland, which he represents on the top board of the World Chess Olympiad. This article is based on the article Viktor Korchnoi from the free encyclopaedia Wikipedia and stands under the GNU-Licence for free documentation. In the Wikipedia a list of the authors is available.